Moving to Adyar? Here’s 10 Reasons Why You’ll Love Living Here! One of the most expensive, quaint neighborhoods of Chennai is Adyar, and the city gets its name from the Adyar River which flows nearby. The city has rich historical and cultural roots which are sprinkled with some of the oldest houses in the city. In many ways, Adyar is a fine mix of the old and new, and this is one of the things which has endeared it to people seeking Flats for sale in Adyar. It is home to the IIT campus and with the Guindy National Park in proximity, it is considered one of the best spots in the city with the best eateries, and easy access to Besant Nagar beach and a shopping hub. A walk down the quiet bylanes to enjoy simple traditional south Indian dishes at popular family-run establishments is not uncommon as well. The number 1 reason Adyar is one of the most coveted places to stay in Chennai, is due to the fact that it is very well developed and easily connected to the main residential spots in the city centre, Whether it is Mylapore, Triplicane or Mandaveli for Temples, T-Nagar, Nungambakkam and Alwarpet for Food, Commercial Establishments, Shopping and Offices, or Kotturpuram, Besant Nagar, Thiruvanmiyur, ECR and OMR for the newer entertainment hotspots, none can match living in Adyar and being able to zip zap across the city with ease for multiple requirements. Chennai as a city may not be famous for its green covers and it has been reported at having the lowest among all the metropolitan cities in the country. However, Adyar seems to be excluded from this bad repute, as it has the highest green cover in Chennai of over 30 percent which makes this part of Chennai very comfortable to reside in. Adyar is an epicenter of cultures, and this is why the delicacies which are available for residents of this city are numerous. One can find Vegetarian Thalis, North Indian Food, Chinese Delicacies, Thalapakattu Chicken Biryani, Chettinad cuisine, and Saravana Bhavan on almost every other street. There are several large temples in Adyar, and it almost seems like they are everywhere. You can see as many as three to four large temples in a single street. There are also huge gopurams, tall shikharas, excellent antiques adorned in silk and gold can be seen throughout the day, especially if there is a celebration on hand. I doubt you have ever heard of serious mugging attacks or heinous crimes in Adyar despite it being a melting pot of almost all cultures, religions, castes and races. This is one factor which makes Adyar extremely safe to relocate to, especially for persons coming with their entire family. Getting a house for sale in Adyar means you get to enjoy considerable peace of mind, contrary to what you can get into, in some other parts of Chennai and India. Adyar is a place of non-stop fun, and you will find available drama, classical music concerts, quizzes, spelling bee contests, Bharatnatyam shows, art exhibitions, movies and painting exhibitions. You will find at least one of these on show every single day in many of the several auditoriums in Adyar. Adyar is one of the most expensive places in Chennai with the average price of a house for sale in Adyar between Rs 10,700 and Rs 17,000. One of the major reasons for the price of real estate in Adyar is the quality of infrastructure found here which includes an excellent transportation system, portable water, good roads and a working government. 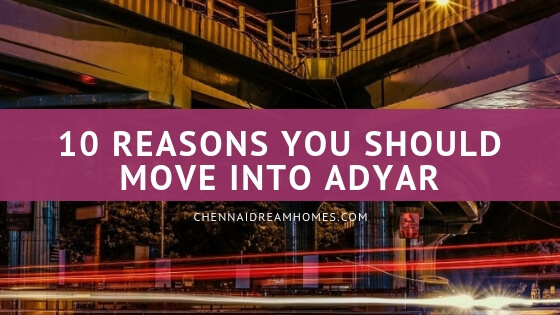 These are but a few of the factors which a lot of people put into consideration when moving to a place and Adyar scores high in all these. Despite its thriving metropolitan environment, one of the stand-out features of Adyar is that it manages to be uncrowded, and this is commendable especially for persons looking to relocate with their family there. The roads are well-structured, and there are multiple means of transportation like 3 different Metro stations, and a Bus Depot which allows for less-crowded areas. Adyar is home to many good schools which include the Adyar St Patrick’s Anglo Indian Higher Secondary School, one of the oldest and biggest schools in the region. Others are the St. Michael’s Academy, Kendriya Vidyalaya, The Hindu Senior Secondary School, Bala Vidya Mandir, Bharath Senior Secondary School, Sishya, St. Johns English School, Sri Sankara Senior Secondary School & Junior College. One of the Best in India, Doctors practising in Adyar are very knowledgeable and take responsibility for your life. Health care is great in Adyar, and very few places in India have health care as good as Adyar. We hope this article helped you clarify why Adyar is a great place to live! If you are convinced of buying a home in Adyar area, and want to move in soon, contact us today. We’ll be happy to set you up with shortlisted homes that suit your style, budget, timeframe, etc. and schedule personalized site visits by appointment to get the process started! Call Neeta / Saravanan today at (+91) 98409 51001 or 98409 51003 to learn more about how Chennai Dream Homes can help. We’re Top Rated on Google! Very professional service by Ms Neeta ! She played the role of a fair mediator keeping both the tenant's and landlord's interest in mind. Will definitely use her services on the next occasion. Very good Hospitality, reviewed our plan and suggested the options matching to our needs. Highly appreciated service. I am a proud owner of a beautiful Villa in the ECR and thanks to Chennai Dream Homes for making this “realty” a “reality”. It was a pleasure working with Neeta and Saravanan who make a great team. They seem very much in sync and worked as a team in this entire tedious process of buying a house. In my case, from the initial house visit to the registered documents procurement post the registration, the entire process took about a year. More of the delay was due to certain reasonable constraints the Seller had regarding the availability of the property. Throughout this duration Neeta was persistent in her diligent follow up and update, however, never pressurized me regarding the deal. I consider this by itself is an art that she has mastered with so many years of experience in this field. Another attribute that needs mention is her transparency in about everything from the price, condition of the house, the availability of the documents, etc. I am extremely pleased in the way the entire transaction was handled. A special note of thanks to Neeta for her availability to be present at the Bank for the Loan formalities on behalf of the Seller. She is also super responsive to any queries by any mode, be it emails, WhatsApp or phone calls. Saravanan played an excellent coordinator role by taking care of all the document formalities. He was always punctual in all of the field visits, be it for document collection/handover or for the follow up at the Registrar’s office. Overall, am extremely pleased to have Chennai Dream Homes as my Property Consultants and will strongly recommend their services for sheer professionalism and hassle-free processing. Especially, in case of ECR properties, Chennai Dream Homes is undoubtedly one of the best! Wonderful team. Neeta takes the trouble to understand exactly what you require. They are very professional. Neeta Chennai dream homes and her team are a different type of real estate people in Chennai. They are frank friendly and open. They understand the needs of the customer and advise.They don't push you to buy the property. Or to say that they're not behind the commission from the customer at any cost. In one word they are honest in their approach and dealings.I purchased a villa though them and I am satisfied. Best wishes to them. Don’t Miss Out On The Best Homes! Sign up for Free. Subscribe for Fresh Videos on YouTube!